At around 4pm on April 8th and with unfavorable conditions, the GT-R Spec V produced a lap time (recorded by observers) at the ‘Ring of 7 minutes 25 seconds. The target time for the Spec V was a slightly more optimistic 7 minutes 20 seconds but with a damp track this wasn’t to be realized. To put it into perspective, last year Walter Rohrl piloted a Porsche 997 GT2 at the same track and completed a lap time of 7 minutes 32 seconds, some seven seconds slower than the Spec V. Even more surprising is the gap in lap times between the standard GT-R and the Spec V, the regular model posting a thirteen second slower lap time at 7 minutes 38 seconds. Spec V test driver Toshio Suzuki suggests that given the right conditions the Spec V could very well produce a lap time that could “blow ones mind”. Following the April 8th tests the GT-R Spec V was taken from the Nurburgring circuit temporarily and switched to general road tests. It has been pointed out that in order to prevent warping of the hood at high speeds of around 300km/h, it was necessary when designing the R35 GT-R to incorporate its now trademark ‘winglets’ on either side of the front bumper. These winglets are still visible on the GT-R Spec V and have not yet made way for the two air intakes we mentioned in our previous article. The front lip spoiler and rear wing are still undergoing tests to achieve excellent front and rear balance but in order to keep drag to a minimum they are unlikely to be changed much from their present design. A source close to the Nissan development team has confirmed that the Spec V has an unladen weight of 1590kg and a power output of 550ps, but made no mention of an ‘over boost’ function as reported in our previous article. A power improvement of 80ps and a weight reduction of 150kg puts the power to weight ratio at 2.89kg/ps which puts the GT-R Spec V in another league. These figures will likely help the Spec V achieve a ten second 0 - 400m time, a good improvement over the already quick 11.6 second quarter mile of the standard car. The rear diffuser has been changed to a carbon fiber item with a NACA duct added as an exit point for heat that builds up towards the rear of the exhaust. A stainless steel exhaust system has been used until now to check for signs of weakness in the structure of the exhaust system and points of extreme high temperature. This will be changed to a more heat resistant and lighter titanium item in keeping with the Spec V’s weight reduction plan. Will debut in October this year. With the abundant use of carbon fiber and titanium we can expect the Spec V to sell at around 13,000,000 yen." The regular GT-R already has a carbon fiber rear diffuser with NACA ducts in it. You can always only take most of this information with a grain of salt. 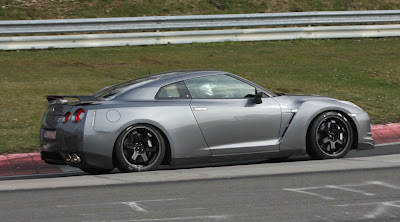 I still think we are going to see a car thats about 150 lbs lighter , and about 40 hp up on the regular GT-R. If its going to actually be about $130k though, thats a bit more than the ZR1. I think the actual target is the ZR1 at around $100k. For that 100k, you will see less technology, and more weight. If they need a stronger car in a few years, they will lose more weight and gain more power with some other special edition of the GT-R. That is, if the money makes sense, and the world doesn't switch over to all electric cars in the next few years. I refuse to call it a SpecV. oh no we wont be switching. electric cars aren't plausible cause they just pollute in the form of power plants.